Sound RIDER! 's roaming moto-journalist caught up with world record holder Liam Stewart and interviewed him as he prepared to circle the North Pole on his KTM 1090. Stewart previously set a world record for being the first motorcyclist to ride completely around the continent of Antarctica over a three month period. His North Pole Arctic Perimeter Ride, scheduled to begin in June, takes advantage of June and July having the longest daylight hours for his self-proclaimed "World Record Setting Maximo Arctic Motorcycle Adventure Ride." 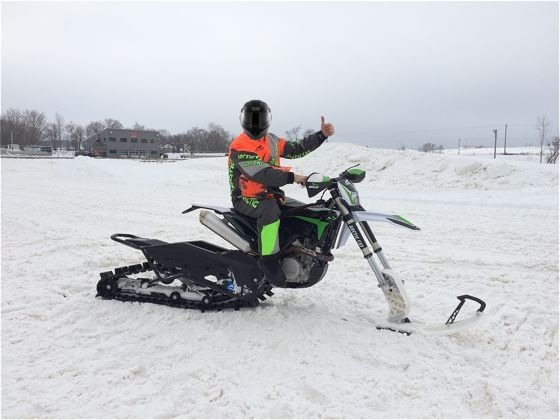 Photo: while it's a thumbs up on Arctic Cat's sled conversion, Stewart will utilize a KTM 1090 Adventure for his perimeter run. SR: Pretty cool, your Arctic Perimeter record attempt. What tricks are you carrying forward to the Arctic ride from your Antarctic record ride? Stewart: First, it's not pretty cool, it's frigging cold! Cold enough to freeze your bladder water before it hits the ground, so I've a Texas Catheter trick I learned from an Ironbutt entrant. The catheter dribbles my urine down my leg and off the lower back of my electrically heated snow pack boots. SR: Are you using studded or special spiked tires? Stewart: I've removable tire chains designed by the ICESTITCH Company in Minnesota. With their cold winters and being on Lake Superior, they have become the global experts in cool adventure riding equipment. Besides the tire chains, those of us in the real adventure riding club know it's not the tires that make the man, it's the man that makes the tire do the adventure. SR: What kind of cold weather riding gear will you use? Stewart: A highly modified snowmobile suit, engineered by the FLIM Company. They have come up with a Chinese manufactured cold weather suit good for -80 degrees, which includes gloves, face mask, and snow pack boots. It looks like a spacesuit and is a bit heavy, plus requires 200 amps to keep it warm, but the weight problem of the battery power was solved by a length of electrical cable connected to four marine batteries in the Austrian TOURSABIGEURO Company designed sled. At night the batteries are recharged by generators carried in the snow machines guiding me. SR: How do you support yourself with needed gas, food, water, and sleeping in the extreme cold weather conditions? Stewart: I'll pull behind the KTM sled stocked with my basic needs. If the crevasses are too wide to jump with the KTM and the sled, it can be disconnected and I can manually muscle the sled down and up as I did around Antarctica. For the extreme conditions I have my camera support crew following on snow machines. They cannot touch my motorcycle, sled or me to meet World Record requirements, but they can carry the ropes, ladders, and bridging equipment needed for me to traverse the tough stuff. My sled has a South Face designed pop-up tent built into it for sleeping and hiding from severe weather conditions. Gas will be dropped ahead of me by a helicopter supplied by a government agency charged with diffusing the fake information about climate change. As for water, I'll melt snow and ice. SR: Won't you have to pack out all your excrements and used supply containers to meet ecological rules and environmental concerns? Stewart: The NitFlex camera crew will collect my droppings and Very Important Papers, recording locations with GPS waypoints for verification by the Save The Arctic Fox Foundation, a non-governmental organization supported by the Will Google Family Fund. It is to ensure I leave no footprints, other than digital ones, on the virgin ice, snow, and tundra. SR: What is your planned route, given that the North Pole is not on an island continent like when you circled Antarctica? Stewart: I'll ride the KTM pulling the sled overland from Deadhorse, Alaska, to a point 100 miles from the geographic North Pole, and then circumnavigate that point in a circle with a 100 mile radius. SR: In the summer some of the Arctic Ocean that surrounds the North Pole will be water, so how will you get your KTM and the sled over those sections? Stewart: I've heavy duty air bladders designed by the SEALINE company to keep the motorcycle and my sled afloat. The helicopter will pull, by a length of rope, my small flotilla across those water sections. SR: What's your personal background that makes you so confident to undertake these extreme cold weather motorcycle adventures? Stewart: I'm from the north of Ireland and was raised in Poland, well known for long periods of cold, snow and ice. When I was in the Army I learned about helicopters from my aerial training, hanging out the doors in extreme cold weather conditions to take photographs. After I got out of the Army I bought a used DKW motorcycle and tried to make a living as a motorcycle courier. A girl I was seeing at the time miscounted by a few days and on the exact date she was ripest I planted a seed. I did not wish to be married and raise a child, so I went on the run from the government, the girl, and child support with my DKW. This meant I had to move almost daily, throughout the winter, with all my belongings. I often rode over ice, through snow storms and freezing cold rain, so I am well trained as a cold weather motorcyclist. I put several 100,000 kilometers on that DKW while on the run. SR: How do you pay for these record-setting motorcycle adventures? Stewart: I've a GoFunMe website where I accept donations, mostly from Silicon Valley, California, and Redmond, Washington, workers who have big money, no time, and no real desire to experience adventure but have been bitten by the glamour of adventure riding. They want to see their names associated with my project, but frankly are buying a bit of motorcycle adventure fame and glory. From the Kafe Press I sell t-shirts, coffee mugs, ADVENT stickers, and baseball caps under the flag of MAKE THE POLES GREAT AGAIN. A big money maker was my all color cookbook, ANTARCTIC COOKING FOR ONE, and after the North Pole project I'll put out a second all color cookbook, ARCTIC COOKING FOR TWO. I'm a vegetarian so I have to carry twice the weight in vegetables than a person who is a meat eater needs for protein. SR: Simply amazing. You're a 21st century cold weather adventure motorcycling icon, seeming to have found a way to finance an interesting and economically rewarding lifestyle. When not "Making The Poles Great Again," what are you doing with your downtime? Stewart: My lengthy vacation has been spent in the Caribbean. I rented bungalows on the beaches and measured the height of waves rolling ashore. It's a film project I hope to market to stressed-out IT workers as a self-improvement download or app. In an average day, I measured around 1,000 waves, documented their height with a hand ruler and digitally recorded them. SR: Now that's interesting, but where is the connection between the waves, audio/video apps, self-improvement, and adventure motorcycles? Stewart: Every 88 seconds I insert a video clip of me driving an electric motorcycle sidecar rig in and out of the waves. Since it is electric it makes no noise, therefore does not interrupt the sound of the waves. The smoothness of the electric machine contributes to the soothing adventure of being at one with Mother Nature mixed with modern technology and the safety of driving three wheels. The viewer moves into a cosmic adventure riding zone much like Joe 12 Pack zones out after watching Sunday football resting in his Lazyman recliner. SR: Any last comments for the followers of this interview? Stewart: Buy my cookbooks, make the poles great again with a significant cash donation, and purchase a cap, coffee mug, ADV ARCTIC event sticker or t-shirt. Follow me on social media and pay to subscribe to my YouTube channel, and remember, my work is not really about the adventure, it's all about me and your money. Contributing or buying my products means allowing me to bask in the warmth of equatorial beaches. Editors note: In August Liam Stewart will be auctioning off a lot of his gear used in circumnavigating the poles. Monies raised will go towards the International I Believe in Loki Foundation (IBLF). For a detailed list and how to go about bidding, CLICK HERE.